First, apologies for the prolonged quietness. It has been, and will no doubt continue to be, a very busy year for me and as such, this is the last blog post you'll see on Food, Booze & Shoes for a while. The reason? 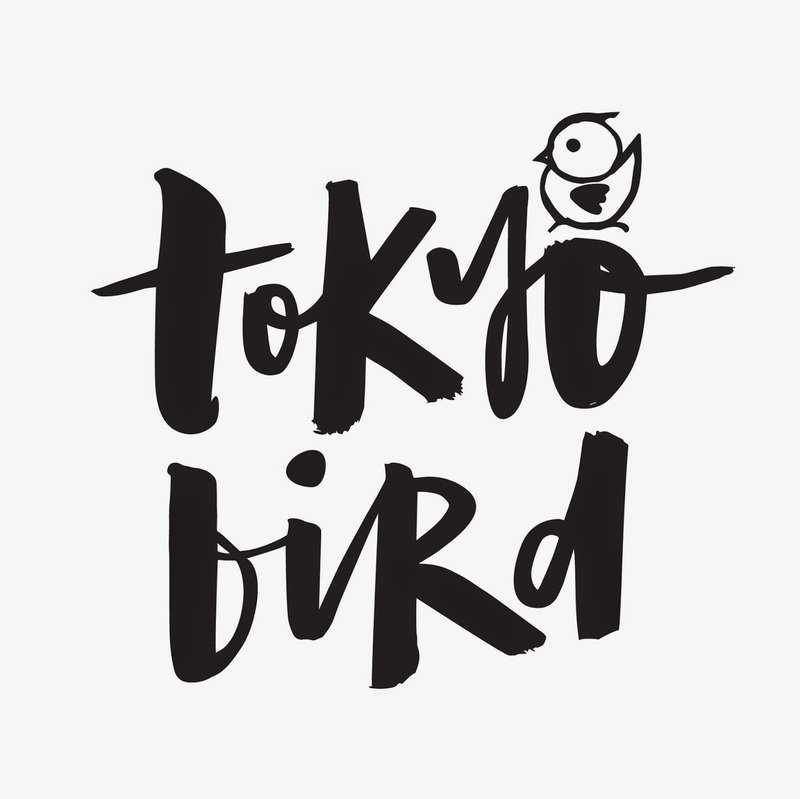 Small bar Tokyo Bird opened in a quiet Surry Hills laneway in late December 2014 with my partner Jason at the helm and a small crew that includes, on some nights, me. 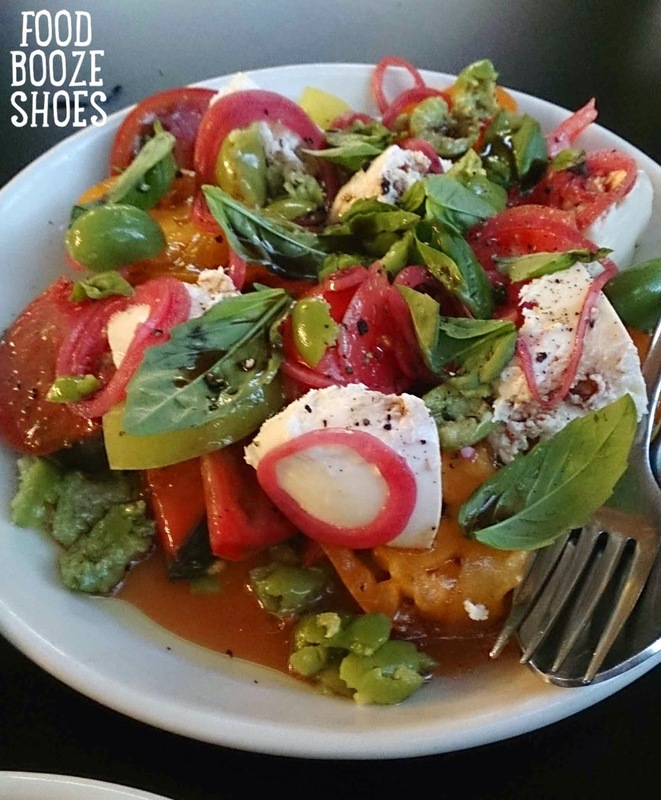 That's right, Food, Booze & Shoes is transitioning to something more like Booze, Booze and some Food. Tokyo Bird is the realisation of a long-held aspiration for us, especially Jason who's been shaking Boston tins for at least the last 12 years. While we've been hit with all manner of delays over the past 12 months or so, we're proud to finally be open on the unbeaten, footpath-less Belmore Lane in Surry Hills, right behind Brooklyn Hide and around the corner from Bodega and the Keg & Brew pub. Our concept brings together Tokyo's refined cocktail bars with the Japanese 'salaryman' favourite of a yakitori-ya, in a very Sydney incarnation of a laneway small bar. With an intimate space licensed to hold 60 patrons, it really is a place that we would want to hang out in for chilled drinks – whether it's beer, our award-winning bartender Yoshi Onishi's house cocktails, sake or an introduction to Japanese whisky. On the food side, particularly having determined that I'm most definitely an eater after a few drinks, we've got a selection of nibbles and yakitori grilled skewers for some pretty decent drinking food. Check out what the lovely Lee Tran from The Unbearable Lightness of Being Hungry; Lorraine from Not Quite Nigella and Corinne from Gourmantic had to say about us, as well as articles in SMH's Good Food, Broadsheet, The Urban List, Concrete Playground and TimeOut Sydney. It's been six great years of Food, Booze & Shoes with more than 700 posts published on Sydney restaurants, bars, events and festivals. But it it feels like the time is right to put the blog to rest for now as the food blogging community continues to evolve and change, and my own spare time and resources have all but disappeared. Personally, it's been six wonderful years of eating, drinking, getting around town and connecting with very like-minded individuals. It's also been six long years of photo selection and editing, late nights writing and trying to remember what something I ate weeks ago tasted like - these parts I won't miss so much. Heartfelt thanks go to my contributors - Hendy, Janice, Kath & Mark - for their efforts over the past year or so - it's been so great to share the blog with you and in return, experience your perspectives and passion for all things food and booze. Many hugs to the other bloggers (and no-longer bloggers) out there who I can happily call friends - I won't be seeing you at events and picnics any longer, but Tokyo Bird hopes to see you soon! So while you won't find me here much any more, you will certainly be able to find me at Belmore Lane in Surry Hills, or on Instagram, Facebook and Twitter – and even on our own blog from time to time. The 12 months of 2014 have been some of the craziest yet in my life, and not in that drunken, dazed manner of my early 20s. With new responsibility, the year has had so many distinct twists and turns that it feels like at least two years in one. Here's some of the high points of the year in food, booze and events, including highlights from contributors Hendy, Janice and Kath & Mark. I fell head over heels for Nomad this year, which seems to be a collection of all the things I love in a space I wish I had and done in just a slightly more hipster manner than I can identify with, But with the calling card of the platter of completely house-made charcuterie, Nomad well and truly has my number. 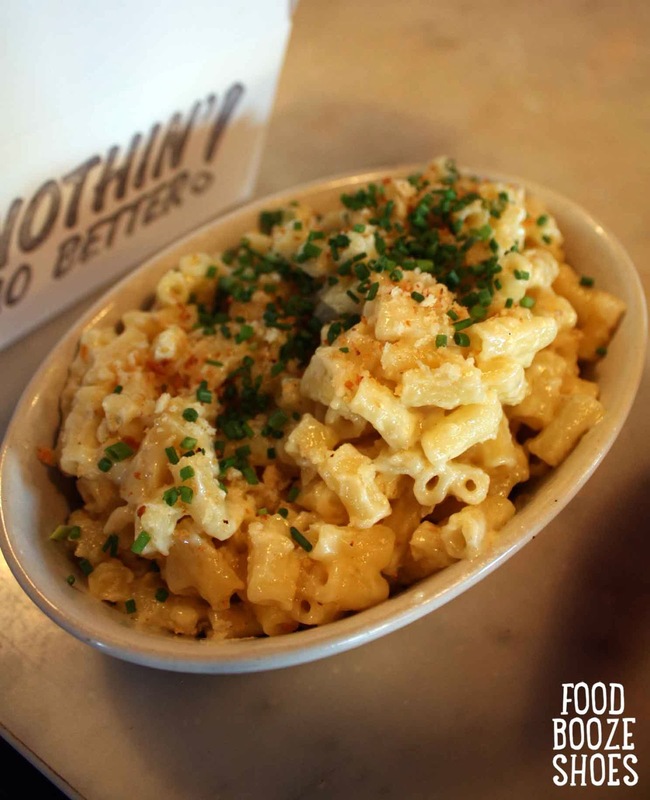 My appetite for pasta, and carbs generally, hasn't waned one bit and the American-style mac'n'cheese at Miss Peaches Soul Food Kitchen above Newtown's Malbourough Hotel hits all the right spots. Ridiculously cheesy and rich, garnished with chives and a house chilli sauce on the side, it's pure cheese and carb bliss in a side dish. It's taken me a while to discover the joys of thick-based pizzas at Cipro - pizza al taglio in Alexandria. And it makes me sad that I didn't know about their sensational Caprese salad earlier. Heirloom tomatoes, pickled Spanish onion rings and smashed green olives take the classic insalata Caprese up several levels. I've really come to like mussels over the last couple of years post realising that they're only rubbery when they're overcooked. 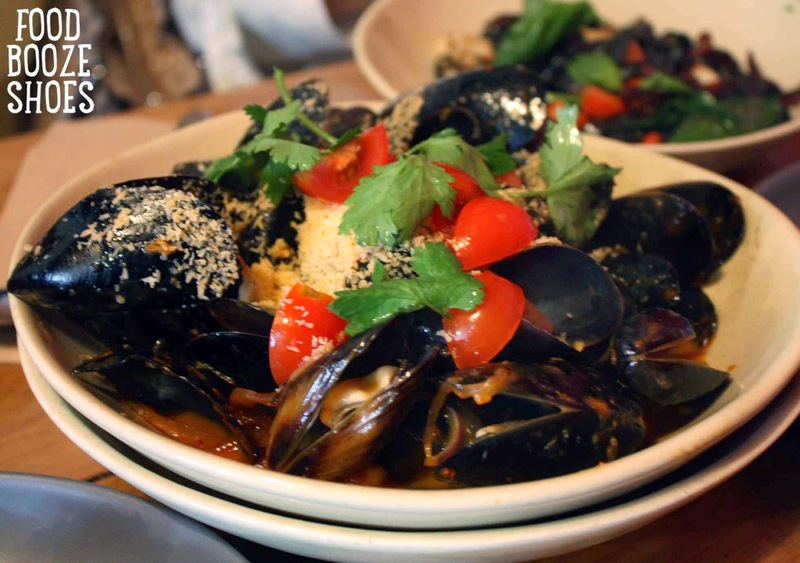 The best version I've had yet has to be Bronte's Three Blue Ducks' steamed mussels with coconut sambal, fresh herbs and cherry tomatoes - dish licking good. 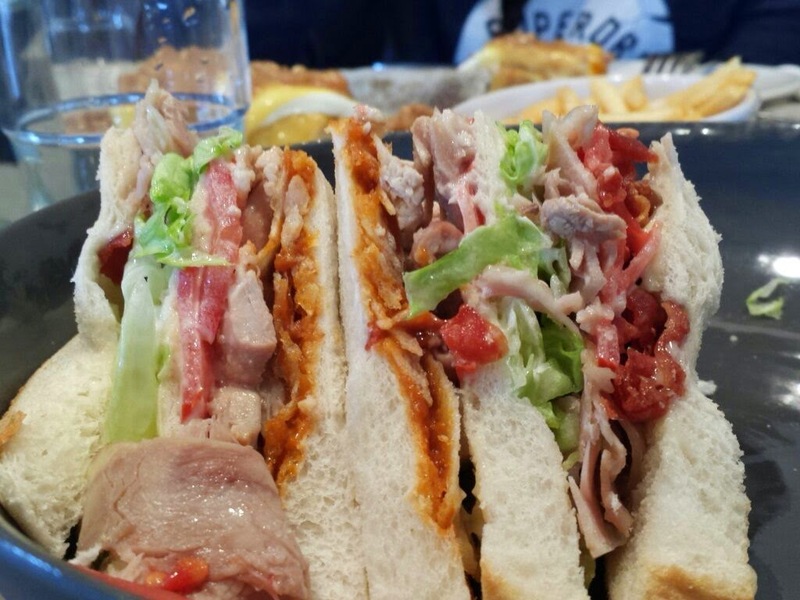 Kath: Pinbone wins for making the best club sandwich ever. Turkey, confit duck leg, bacon jam, crispy prosciutto, lettuce, tomato, mayonnaise and chips on the side. More than enough said. A relatively quiet achiever in the quieter but burgeoning western end of Surry Hills, Bodega is the older but seemingly more experimental sibling to the wildly popular Porteño in the same suburb. Argentinian tapas produces the likes of a creamy fish pate served alongside pickled anchovies, loud music and unmissable rockabilly style. 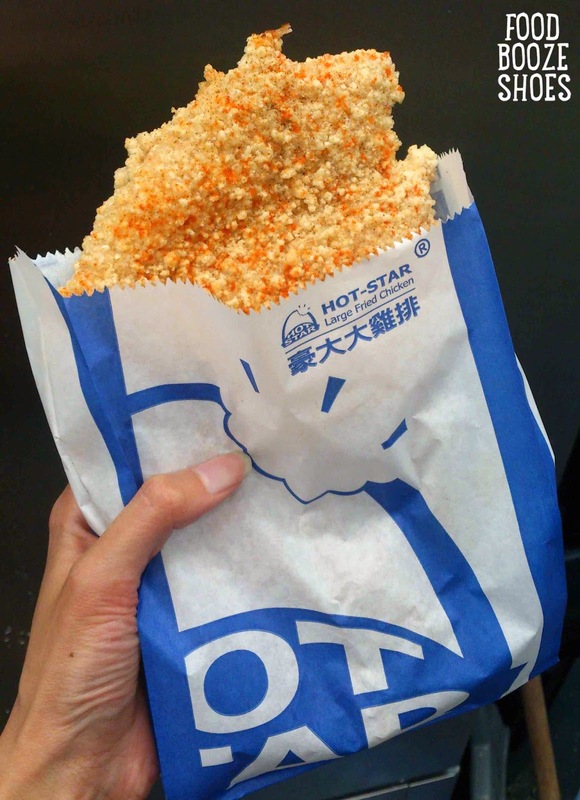 The mere mention of 'Hot Star' gets me salivating. From Taiwan, Sydney's first Hot Star Large Fried Chicken outlet in the city south is what 3am dreams are made of. A half chicken breast, deep fried fresh to order with a sprinkling of house recipe chilli powder, served piping hot in a paper bag - sweet dreams are made of fried chicken. 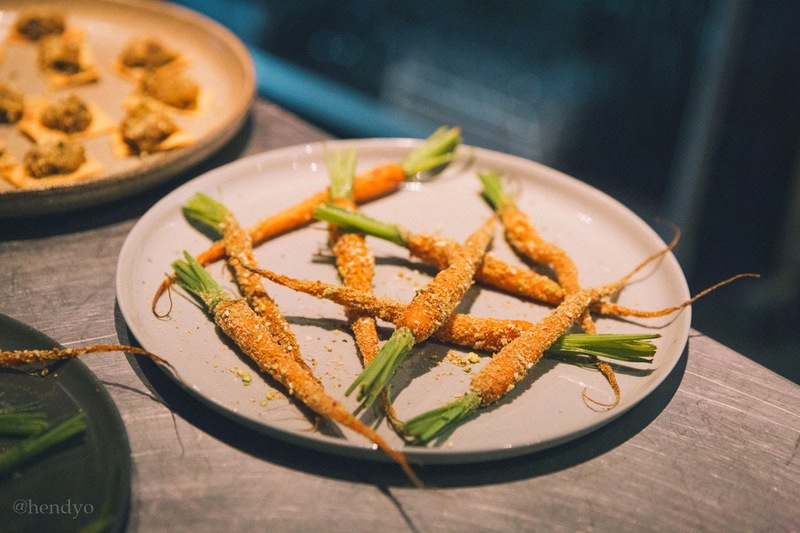 The 'A Taste Of...' series of dinners at Intercontinental Sydney earlier in the year were excellent opportunities to learn about local producers and enjoy them in a fine dining environment. As part of the 'A Taste of The Dairy' dinner, the baked Reblochon cheese with confit fig was a knee-weakening rendition of a cheese course. 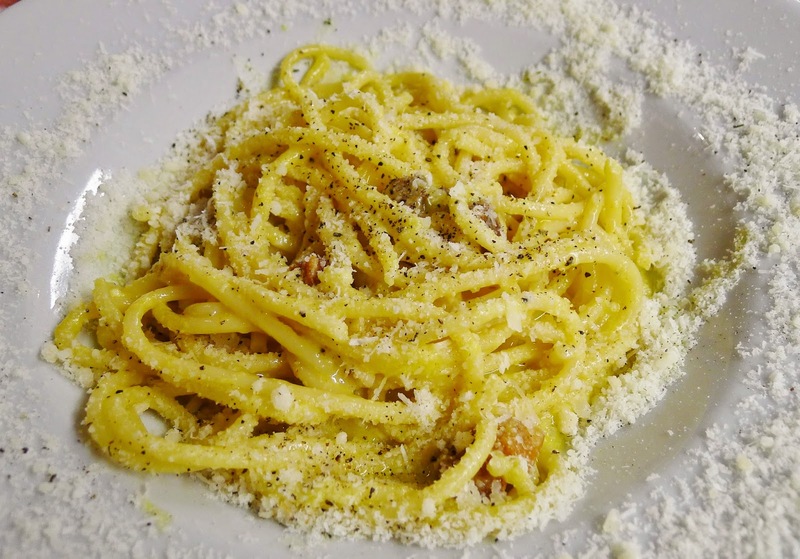 Janice: My favourite dish this year had to be the carbonara in Rome. It was so spectacular because it's my quintessential dish of carbs, cheese (pecorino romano) and cured meat (guanciale or pig cheek, in this case). I've taken to never eating it when I'm out any more because nothing beats the ones I had in Rome. I'm glad I got to tick Alpha in the CBD south off the list this year, as was Kath. 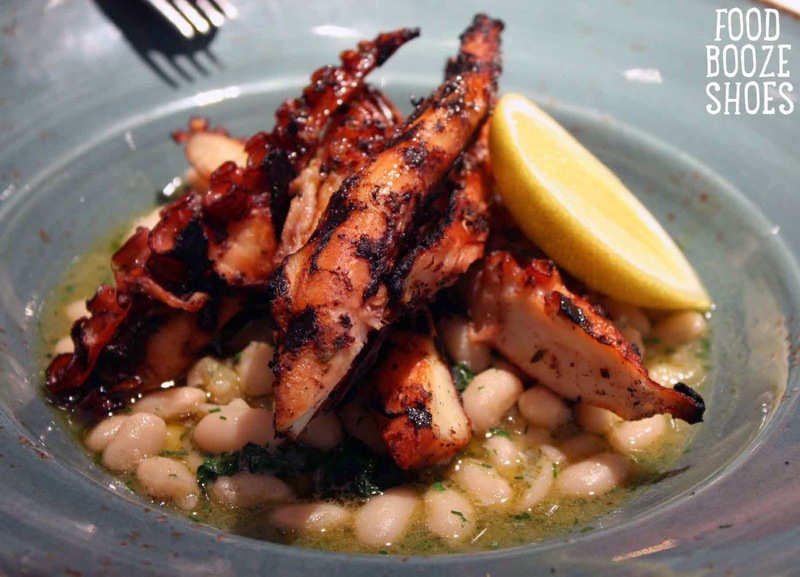 The grilled octopus tentacles were an unexpected standout for me, cooked tenderly and smokily for one of the best occy dishes I've had in ages. 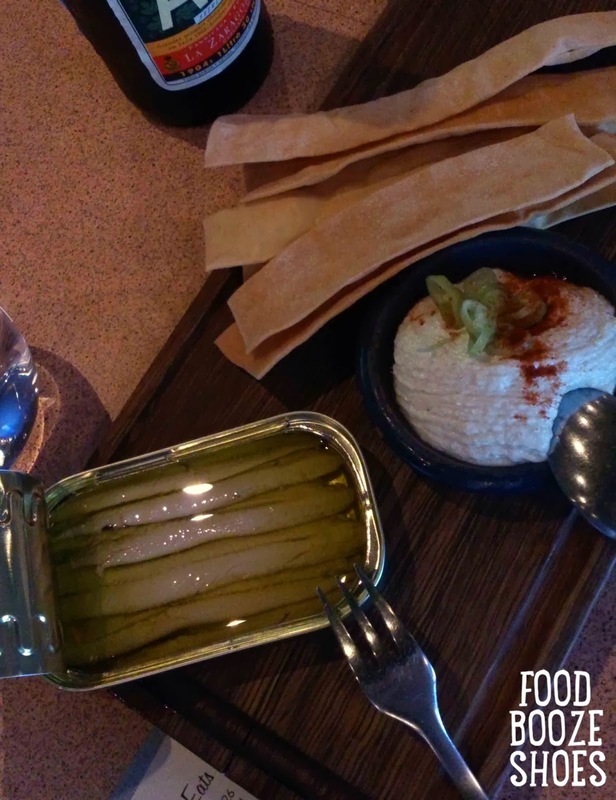 Kath: Alpha was a highlight for bringing a modern twist to traditional Greek food. The highlight of the menu for me was the melt-in-the-mouth pickled octopus with cucumber and sun-dried olives. Bacon. Aioli. It's all I needed to hear at Bishop Sessa at the quieter end of Surry Hills' Crown Street. 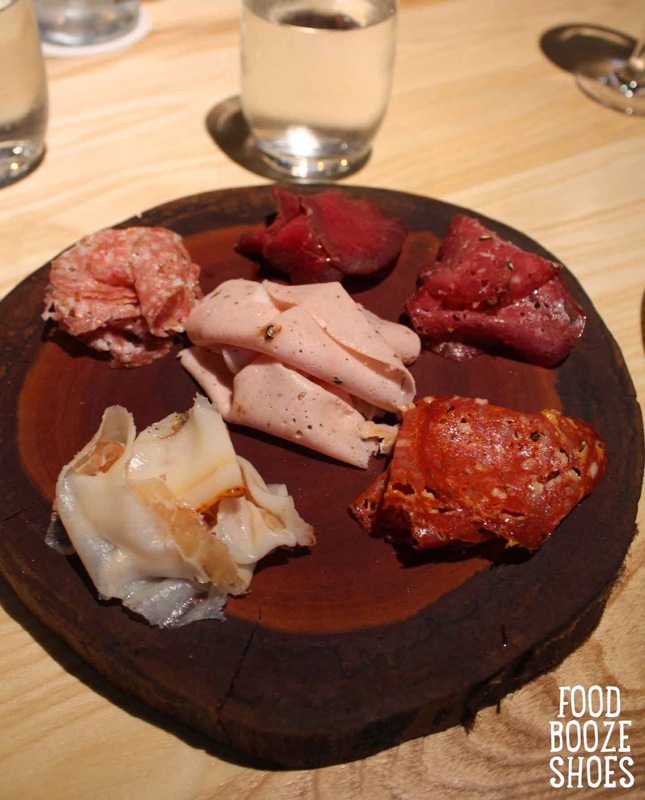 Their 'I Dream of Pork' degustation was absolutely dream-worthy with all sorts of porcine goodness ranging from chicarrones to blood sausage. 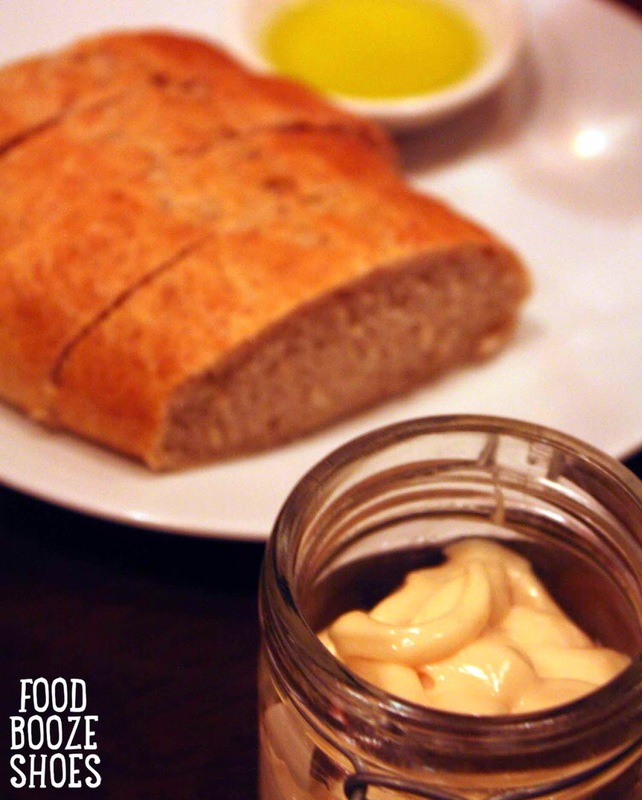 They had me from the bread course which was served with a smokey bacon fat aioli that was probably a nutritionists' nightmare but dreamy on all other counts. Undoubtedly one of the naughtiest things I've eaten this year are the Macanese pork buns at Chefs Gallery Wynyard. 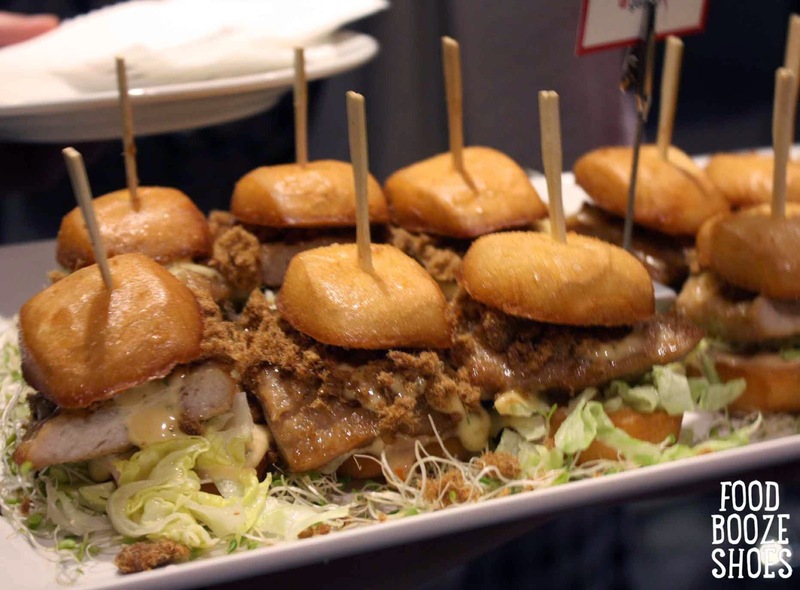 Featuring a deep fried pork cutlet and spicy mayonnaise on a deep fried man tou style bun, the fried-on-fried burger oozed with fatty deliciousness. I made it to Melbourne for their annual food and wine festival this year, joining in on the long lunch action at Red Spice Road. 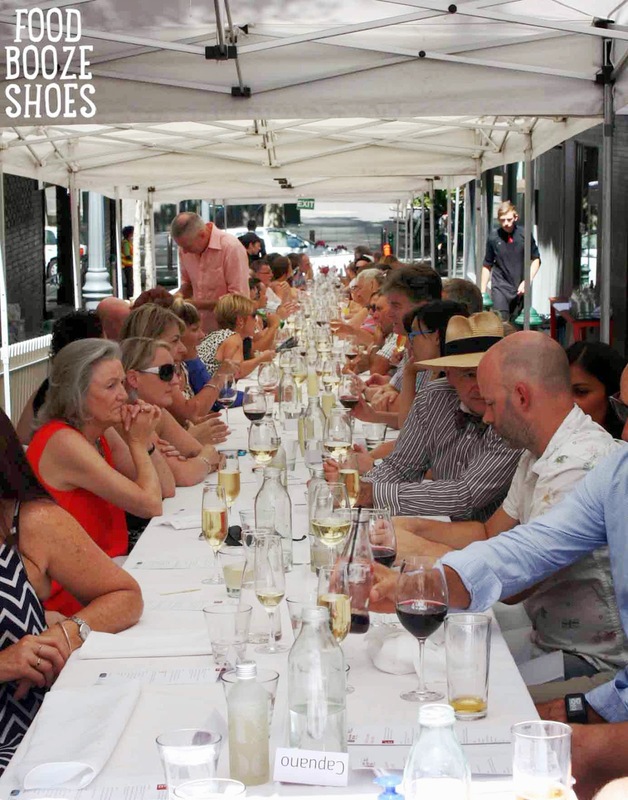 With numerous courses of shared dishes, heaps of seafood and wine flowing, it was a most pleasant lunch experience in one of Melbourne's iconic laneways. Hendy: The emotional roller coaster that was the World Cup was hosted in Brazil this time round. 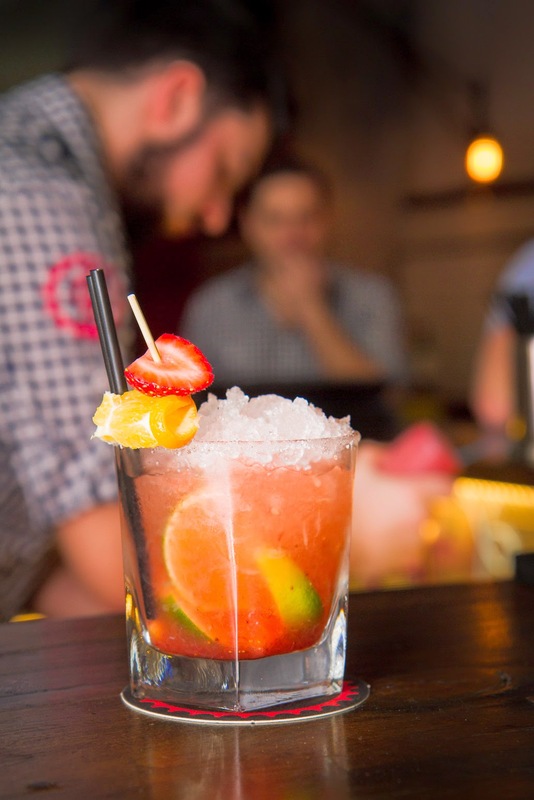 We all shared moments of tears, laughter and joy at the Flavours of Brazil dinner at Bridge Street Garage, including this lovely and colourful Caipirinha. Unlike at the soccer, this was a winner from Brazil. A famil to Blacktown this year was quite an event for this inner city/inner west dwelling girl. 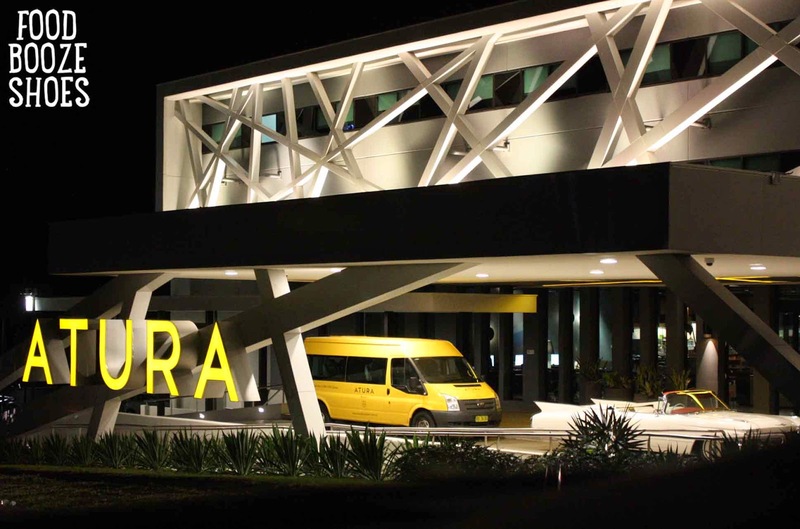 Atura Blacktown is a relatively new boutique style hotel in the area next door to one of Sydney's only drive in cinemas. The hotel is modern, quirky and very well equipped for the Wet'n'Wild guest, business travellers and western suburbs tourists alike. Definitely the most fun event of the year was the Tanqueray Bar Hop as part of Good Food Month. One night, two girls, one chauffeur and four bars serving Tanqueray gin cocktail specials. I still keep a hopeful eye out for a chauffeur outside my work to pick me up and take me to a bar for cocktails. 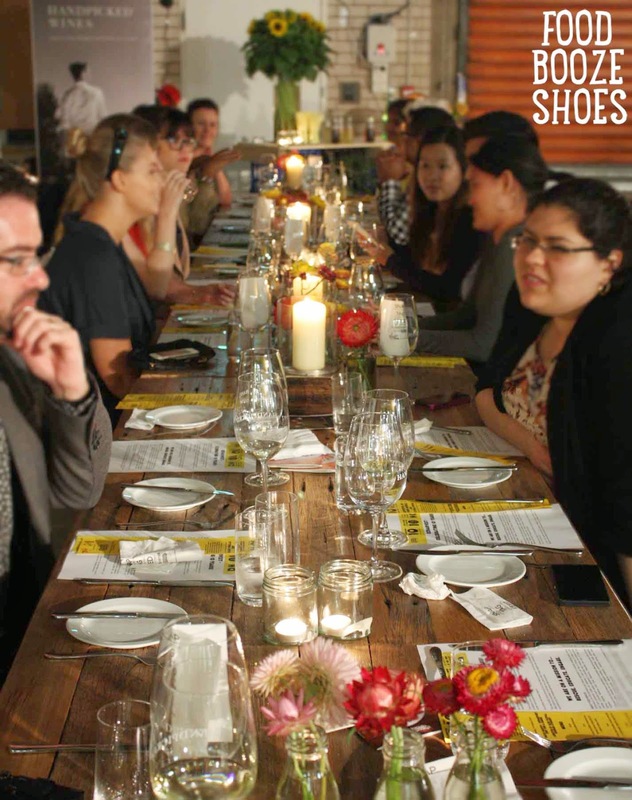 One of the more heart-warming events of the year was OzHarvest's 10 year celebration dinner at their new warehouse headquarters in Alexandria. With a combination of rescued and donated food, OzHarvest's chefs whipped up an amazingly homely, comforting and thoroughly scrumptious dinner, shared with great wines and even better company. Hendy: Also for Good Food Month Sustainable Table, an innovative not-for-profit organisation from Melbourne, launched a clever campaign to raise awareness of food wastage. The food that was presented at the campaign dinner not only demonstrated the elegance of simplicity but also reminded us that good food and good produce can also look a tad imperfect. The sea of sophisticated white that is Dîner en Blanc returned to Sydney bigger than ever. 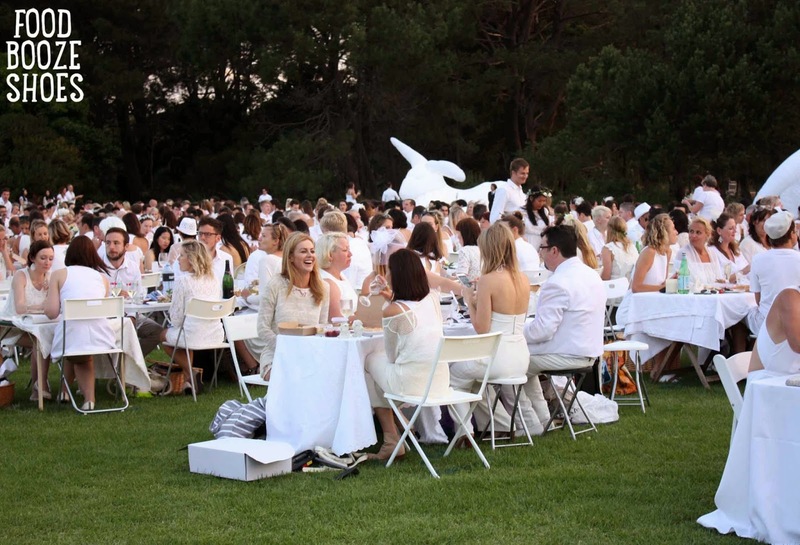 About 4,000 guests participated in the great white picnic in the secret location of Centennial Park this year and thanks to Seppelt Wines, we were wined and dined in total style - in full whites, of course. As the year comes to an end, I'd like to send a huge thanks to my team of contributors - Hendy, Janice, Kath & Mark - for their inspired food-eating and photographing efforts this year. It's been loads of fun, sharing the passion for food and booze (perhaps less so the shoes?). Thanks also to all the readers and followers over the past year, and the five years before it. It's been a year of change, some stress and new responsibilities - and always plenty of food, booze and shoes - thanks for joining me and the team along the way. See you around in 2015! It's that time of the year when champagne flows and one too many is just too hard to resist. For bubbles at brunch too, the new Champagne Room upstairs at The Winery in Surry Hills offers its new brunch menu with champagne on arrival. The Winery is surely a staple on the Crown Street strip by now, but that hasn't stopped them from re-inventing their upstairs real estate into the perfectly decadent retreat that is the Champagne Room. A-la-carte options are available but let the work be done for you with the new weekend brunch offerings and $75 set menu which includes that all important flute of Perrier-Jouet Champagne on arrival. The well-stocked bar upstairs is beautifully decorated with an impressive number of chandeliers, while blue velvet booths and a service bell for when the bubbles are running low offer a luxe escape from reality. Champagne Room's new weekend brunch menu is more lunch than brunch, and couldn't have started any better than with a serving of the most creamy Sydney rock oysters in a light champagne vinaigrette with a lemon cheek on the side. Accompanying these were another favourite of mine, Hervey Bay scallops, covered in a lemon salt, truffled peaches and crispy pancetta which added great contrast to the sweet raw scallops. Continuing with things I love, out came a very generous serving of chicken liver parfait which was incredibly light and fluffy, and would have been more than enough to keep me happy for the entire meal. It was served alongside charcuterie from Byron Bay: paper thin jamon and bresaola, and sopressa salami; all accompanied by a gorgeous selection of cornichons, green apple chutney and mustard fruits. A nice side to the share plate was a fresh sweet red and golden beet salad. With on-trend ingredients of sorrel and kale, as well as the always excellent Jannei goat's curd, a zingy sherry vinaigrette helped cut through the richness of the cured meats and chicken liver parfait. Our last savoury items were the mini mushroom pie and mini wagyu burger. The mushroom pie was full of flavour with champagne, thyme, garlic and truffle salsa mixed through with wild mushrooms and encased in freshly made puff pastry. The sliders sandwiched very well seasoned wagyu beef patties with sliced heirloom tomato, mixed leaves, gruyere cheese and a truffle mayonnaise which I would have loved more of. To complete this journey of Champagne Room indulgence, there were two desserts on offer; first up a chocolate brownie. While brownies can be hit or miss, this one was definitely a hit: rich and moist, it practically melted in the mouth, and served with a generous scoop of vanilla ice cream. A perfect match for a balmy summer's day was the summer fruits dessert, including strawberries, raspberries and blueberries drenched in a champagne sabayon and topped with a berry sorbet. With brunch available on weekends from 11am, Champagne Room certainly doesn't peddle the usual brunch offerings. The gorgeous selection of fresh seafood and heartier meals, and of course, Perrier-Jouet champagne makes it pure brunch decadence on Crown Street. 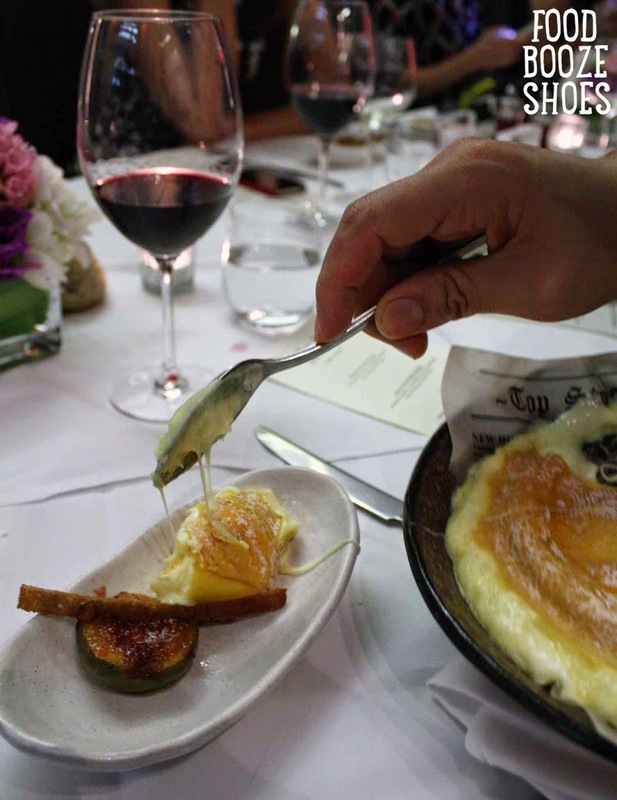 Food, Booze & Shoes dined at the Champagne Room as a guest, with thanks to The Mint Partners. 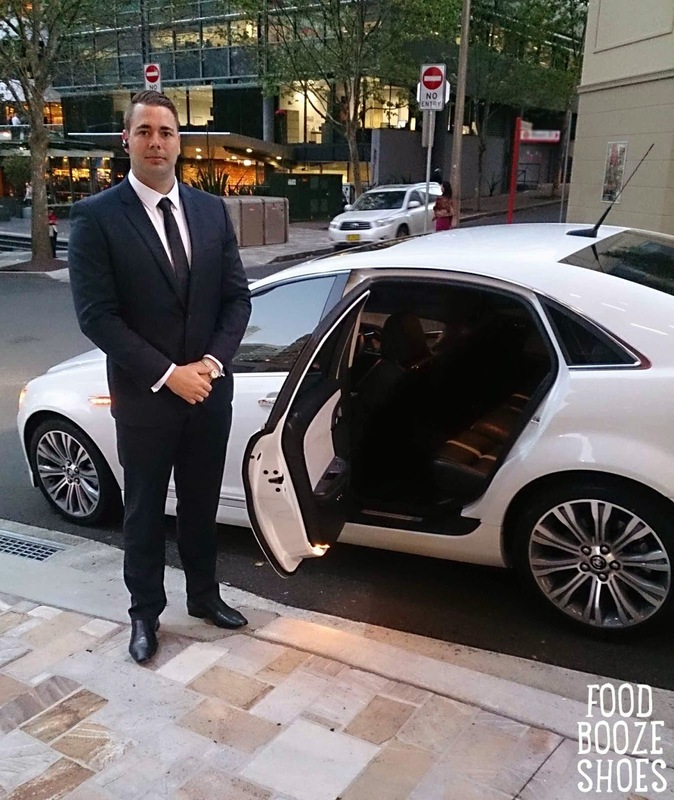 Food, Booze & Shoes features Sydney restaurant and bar reviews, events and festivals of note, a bit of travel, and other things that make us laugh and smile.